Lord Krishna replaces the Halo of Nagle with his awe-inducing peacock feather and swords and shields with the melodious flute. He is the most loved God among the Hindus. He is a protector, a savior, friend, philosopher, fighter, romantic and everything you want from the One. Read on for a few life facts about this Hindu deity. It was after the Great War when Gandhari anathematized Lord Krishna that his kingdom will perish by flood with his people killing them. Gandhari was ardent devotee of Lord Vishnu and hence the curse was pre-destined. After long 36 years of war, true to the prediction Yadavs killed themselves. This was again put into place by the lord himself, for he prayed for a son like Lord Shiva, God of destruction. His son started the chain of events which eventually destroyed Dwarka. Seeing the destruction Lord Krishna went away with his brother and the river consumed Dwarka, as the curse claimed. Balaram vexed from the disaster sat in mediation and was taken away by Adisesha. 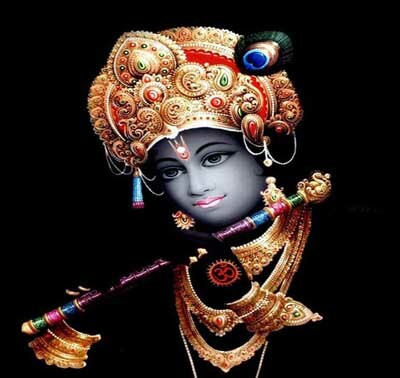 This lead Lord Krishna to move towards his end as human form. Krishna was killed by a hunter’s arrow. This arrow was part of the mysticism which destroyed Dwarka. The King of Dwarka was a deadly and powerful ruler. In battle of Kurukshetra both kauravas and pandavas came to seek his. Arjuna sat at lord Krishna s feet while He was asleep while Duryodhana sat beside him. When Lord woke up, he noticed Arjuna first and as Arjuna was younger Krishna gave him the option to choose first, either Narayan himself sans any weapons and vow to not fight or the narayani Army of over 10 Lakh Soldiers who could rival Krishna himself, with all their weapons. Arjuna chosed his friend philosopher and guide over the army. 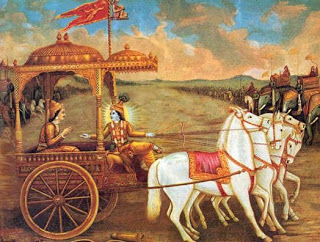 Krishna became charioteer for Arjuna in the battlefield. Krishna guided Arjuna all through his painful dilemma in fighting his teacher, Bhishma Pitamah, Uncles and cousins. Krishna also helped Arjuna keep his vow of killing Jayadratha, the killer of his son Abhimanyu. As the protective layers around Jayadratha were multiplied, Arjuna couldn’t reach him. Seeing this Lord Krishna used Sudarshana Chakra to create a solar eclipse. When Jayadratha came out assuming it to be sunset to taunt Arjuna at this defeat, Krishna cleared the sky and Arjuna came true on his words. The Mahabharata would have been a different epic without Krishna. Lord Krishna had 8 queens, Ashta-Bharyas or Patt-Rani, and over 16100 Gopikas. There are different tales related though. A thought says that the 16100 were in fact prisoners of Narakasura. When Krishna defeated Narakasura the princesses were free. Having been ostracized from society the free prisoners sought Krishna’s help and He being the generous and righteous King gave them the title of his Queen. Others say Krishna never married the 16000 princes, they were rather his Gopikas. As nuns wear the ring as symbol of their commitment to their Lord, they marry the lord in a similar sense. Again, another set believes that as Vishnu in His previous birth as Lord Rama were believer and practitioner of monogamy, Lord Vishnu blessed the women wishing to be Rama s wife with a boon that the wish would be fulfilled in their later birth with Lord Vishnu next avatar. Many sages thus prayed to be Lords companion and hence Lord Krishna had 16000 wives. 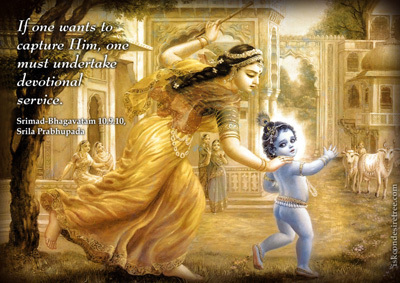 Lord Krishna was the most mischievous as a child. He is popularly called Makhan-chor. Once the churned butter was tied high up to save it from the little tyke, nonetheless Krishna found a way around with sling-shots and continued antics to rile-up gopis. Lord Indra, Krishna picked up the mighty Goverdhan Mountain on his pinkie finger to save the village from the havoc rain caused. As a kid once Yashodha-maiya tried to tie him with a piece of rope to keep him from running away and getting into troubles. The rope wouldn’t fit him and fell short. This kept happening with every size of rope. Mesmerized Yashodha-maiya saw into Krishna’s open mouth to see the whole universe in baby Krishna’s mouth. No one could escape the innocent smile, disarming charm and beauty of the dusky child. Radha is the childhood love of Krishna. 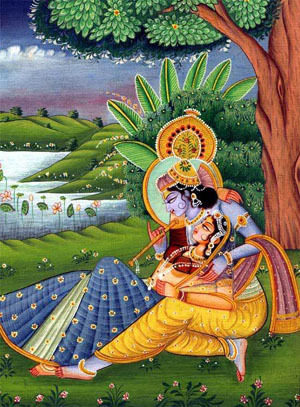 Every romantic artist worth his dime creates a testimony to Krishna with Radha. However Krishna never married Radha. He left Vrindaban for his education and destiny and Radhe-Krishna became the backdrop of literature. 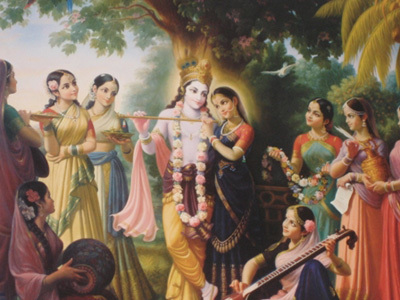 Many women were infatuated with Krishna and fell in love with Him. History remembers Radha and later Meera. Devotional songs and movies have portrayed these stories since then and even now. 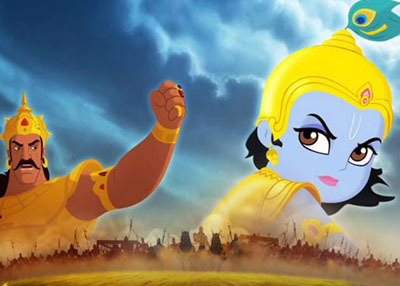 The most celebrated act of Lord Krishna was the Battle with his maternal uncle. Kansa was the Prince of Mathura and brother of Krishna’s birth Mother Devaki. Kansa overthrew his father’s reign and settled on the throne of Mathura by arranging his own coronation. The father Ugrasena was thrown in prison. A Divine prophecy said that Kans would meet his end at the hands of his sisters eight child. Kansa therefore, imprisoned his sister and killed all her six children as soon as they were born. 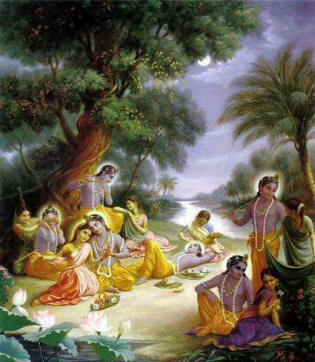 The seventh was Balaram and was shifted to Rohini’s womb. 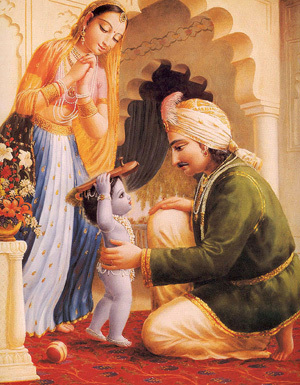 The eighth child was Krishna and was saved and shipped off to Gokul to be raised by Nanda and Yashodha. As faith would have it, Krishna returned to Mathura and defeated Kansa and reinstated King Ugrasena. The fight with Kansa was ante-ceded by many other fights. Few of the most famous ones are: The demon Putna was sent to kill Krishna as a baby. Dressed as a wet-nurse she approached Yashodha and asked permission to feed infant Krishna. The little boy then sucked the life out of her and hence Putna meet her end. Snake Demon Aghasura was Putna’s brother. So, to avenge the death of Putna, Aghasura opened his mouth wide as cave mouth and lured the kids inside him. When Krishna came to know about this, he liberated both the kids and the serpent. Lord Krishna is always pictured is a handsome posture, blue skinned, peacock feather on head, yellow dhoti, one feet firmly on ground and other slightly pointed towards the sky and the mesmerizing flute. Blue color symbolizes the endless and infinite sky. The Lord is hence powerful beyond our comprehension in every aspect be it love or strength or compassion. Lord Krishna has the responsibility of universe and the peacock feather represents the point of view of Krishna towards this responsibilities, feather light! The Flute is the epitome of melody and calmness complimented by the tiny smile on the face. The posture is a symbolic of being grounded and high flying at the same time. Krishna is famous for the tales from Sudama and boiled rice. During education life, Krishna and Sudama were fast friends. Tales narrates that once when they were in the forest together, having spent the whole day there, both children were hungry. Sudama however requested to finish off Krishna’s food as well. In later phase of life Sudama was ridden with poverty and he approached his childhood friend on insistence of his family. Sudama took boiled rice for the King of Dwarka and as Krishna ate individual grains of rice, Sudama’s house is said to transform and fill with wealth. However Sudama felt guilty of approaching Krishna for monetary reasons and he spent his life outside the mansion away from wealth. 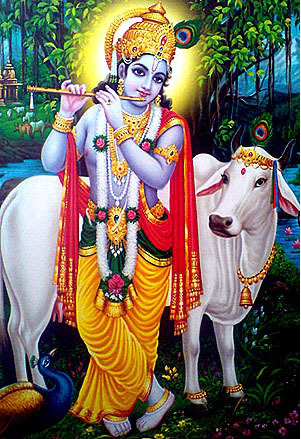 The flute is considered to be the true companion of Krishna. The melody was so surreal that people stopped mid-way to just listen to the music. It is said that Radha didn’t like Krishna’s love for flute coz of the jealousy. The flute has seven holes. Krishna flows through the flute and they are an entity in them-self. The meaning is human is laced with seven deadly sins and when we fight the seven sins, Krishna flows through us and we attain moskha or salvation.